The new AquaPruf Vertical Belt Conveyor from Dorner Mfg. is engineered to move bulk products in straight-up 90° sanitary applications. Featuring Vertical Belt Technology, the AquaPruf Vertical Belt Conveyor comes with a proprietary staggered sidewall belt that provides more pocket capacity than a traditional bucket elevator. 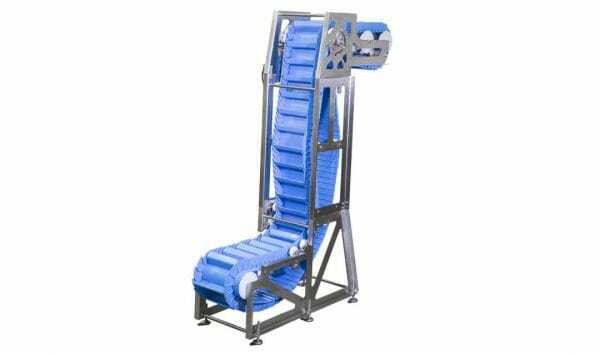 The conveyor comes with an open frame design for quick cleaning and more effective product changeover. The AquaPruf Vertical Belt Conveyor is perfect for elevating bulk products such as: vegetables, fruits/grains/nuts, popcorn, pet food, pharmaceuticals and small packages in applications such as: elevation for walk-thru, hopper feeding, weigh scale feeding, general bulk handling, and sanitary environments. For more information on the new AquaPruf Vertical Belt Conveyor, visit the product page.